Go run, swim, bike. Just GO. Do what you love as part of Team IMPACT's GoTeam. 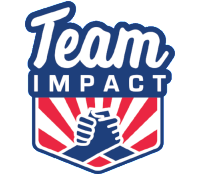 As a teammate on one of our official or unofficial race teams, you can help raise critical funding for Team IMPACT. Whether you want to run, bike, swim, tackle a triathlon, or come up with another athletic pursuit, we want you on the GoTeam when you cross the finish line! When you race as a member of the GoTeam, you create awareness and bring financial support to the Team IMPACT program. All proceeds raised through your fundraising efforts go directly towards supporting our mission; allowing us to connect more kids with serious and chronic illnesses to local college athletic teams which allows them to form life-long bonds and life-changing outcomes. "I wanted to give back to the organization that gave our program so much. We continue to be amazed by our drafted Team IMPACT child." "I worked at Team IMPACT for three years and was deeply touched by the courage and fight I witnessed in all the children and their families. I was thrilled to run the NYC Marathon and fundraise for Team IMPACT, so they can continue to reach more children who will benefit from the support that comes with having a team by their side. I saw the magic of Team IMPACT firsthand, and I am honored to give back for all the organization gave me." "For me, Team IMPACT children have redefined what it means for something to be hard. They have changed my understanding of what it means to be tough. They have made a few painful hours pale in comparison to the months and years they battle with no clear finish line." Official Race Team: Apply to receive a bib as part of one of our teams; tabs to the left of this page show our official race teams for the upcoming year. You do not have to have a qualifying time to run a race/marathon! If your application is accepted, you will be required to reach the specified fundraising minimum on behalf of Team IMPACT. Unofficial Race Team: You can compete in any athletic event to raise funds for Team IMPACT, without a basic fundraising commitment. When you sign up for your preferred athletic event, you can fundraise for Team IMPACT, for fun! When you choose to fundraise for Team IMPACT on our GoTeam we'll provide you with team perks and the tools to help you reach your goals. If you would like to assemble a team of athletes who will collectively raise money towards a group goal, please email goteam@goteamimpact.org and we will help you create a fundraising event page. The GoTeam is ready to lace up and hit the road in support of Team IMPACT. While they must put in the effort to get across the finish line, you can help our athletes get to the starting line by helping them meet their fundraising goals. 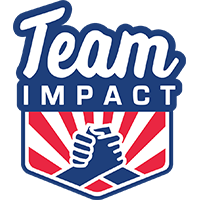 Check out our official Team IMPACT CrowdRise page to support our amazing athletes.